The external surface of the ischiopubic ramus anterior gives connection towards muscles of the medial section of the thigh, towards the ischial tuberosity along with the body of the pubis. Adductor longus, adductor brevis, adductor magnus, pectineus, and gracilis are among those muscles. The ischiopubic ramus possesses external as well as internal surfaces along with lateral and medial borders. The medial border creates the lateral margins of the urogenital triangle together with the equivalent part of the other hip bone. 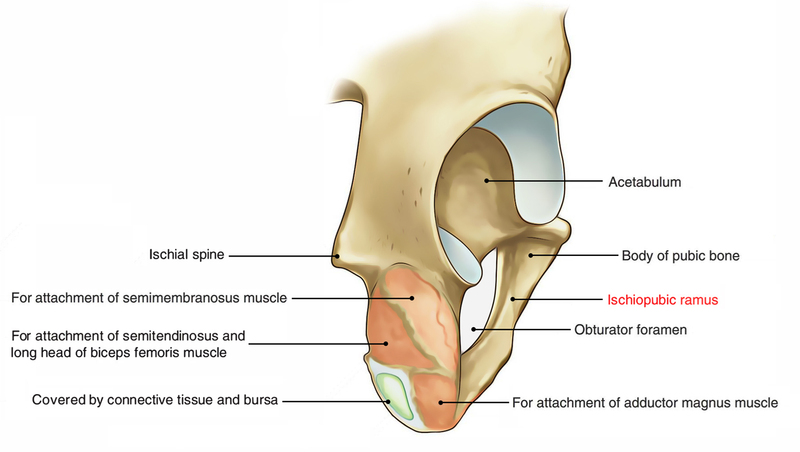 The obturator foramen is created by the lateral border. Superficial fascia of the perineum. Obturator internus muscle originates via the area connecting the lateral border. Connection to obturator fascia along with the superior fascia of the urogenital diaphragm is given by unclear rim at the medial boundary of the origin of obturator internus. Attachment to the falciform process of the sacrotuberous ligament posteriorly as well as the inferior fascia of the urogenital diaphragm anteriorly is given via a second ridge spreading out through the medial margin of the ischial tuberosity towards the lower limit of the symphyseal surface of the body of pubis. When traced backwards the medial border of the ischiopubic ramus connects with the faint ridge giving attachment to the perineal membrane and trespasses on the internal surface. The region of the superficial perineal pouch is the area surrounded in the middle. Posteriorly the superficial fascia of the perineum combines with the perineal membrane. The area of the deep perineal pouch is the area enclosed within. The sphincter urethrae and deep transversus perenei muscles are given origin by it.